Delicious and easy, made with fresh peaches and topped with a fresh blueberry sauce. Enjoy for breakfast or top with ice cream for a lovely and quick dessert. As we were finishing up dinner earlier this week, I casually announced to the family that I was making a Dutch baby. Once I saw the eyes widen a bit around the table, I quickly added “for dessert”, as if that would surely make it all clear. My son, who obviously had places to go and people to see, wanted only to know how long it would take for me to produce this Dutch baby thing. Half an hour, I assured him. Daughter just wrinkled her nose, convinced that it sounded like something she wasn’t going to like. My husband cut right to the chase and wanted to know exactly what a Dutch baby was and why he would want to eat one. You may be familiar with the Dutch baby, but if not, it’s one of those dishes whose name offers few clues as to what it is. 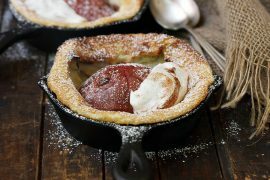 Some describe a Dutch baby as a cross between a pancake and a popover. For me, it’s more like to a clafouti. But however it’s described, I declare it simply delicious. Light and warm, the Dutch baby itself has a custard taste, but with a super light pancake texture. When combined with fresh fruit and served warm, with melting vanilla ice cream, the Dutch baby is perfection and quickly won over everyone in my family. 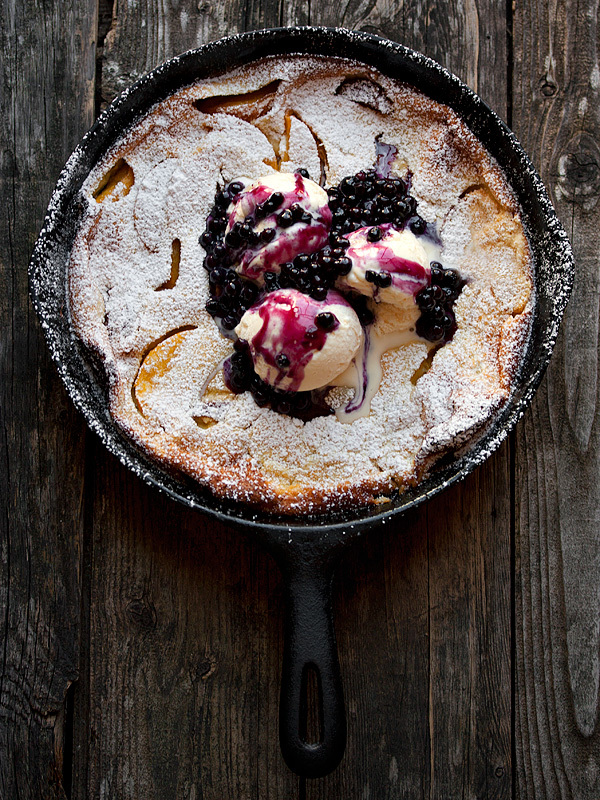 Peaches and blueberries are at their seasonal best right now, so they were my choices for this week’s Dutch baby. But this dessert would be lovely with all kinds of fruits, so it can go with you through all the summer fruits and into the fall and winter, with apples (maybe with a caramel sauce?). You’ll want to serve the Dutch baby warm from the oven. It will puff up while cooking and then quickly deflate. Don’t despair though. It’s supposed to do that. Dust with powdered sugar, top with some vanilla ice cream and spoon some of the blueberry sauce over top (truthfully, the ice cream part is optional, but really … why not?). Put the skillet on the table and allow people to serve themselves from the skillet, or if it’s just family, hand out spoons and dig in. (Be sure to wrap the skillet handle in a cloth, to remind everyone it’s hot). This dish should be served warm, soon after it's taken out of the oven. Serve it right from the skillet. This is a great dish for a late breakfast or brunch, as well. Just omit the ice cream. In a small saucepan, whisk together the sugar and cornstarch. Whisk in water. Add blueberries and cook over medium-low heat, stirring constantly, until thickened and berries are softened, about 4-5 minutes. Remove from heat and stir in lemon juice. Set aside. 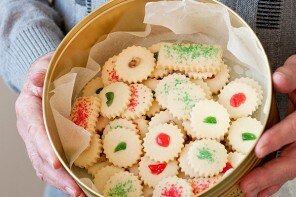 (Can be made ahead and refrigerated. Simply re-warm before using to top dessert). Melt 2 Tbsp. in the microwave and then pour into a blender or food processor. Add the eggs, milk, flour, 1 Tbsp. sugar, vanilla extract, and salt. Blend batter until smooth. Let sit in blender, while you prepare the peaches. Heat a 12-inch cast-iron skillet over medium heat. Add the remaining 2 Tbsp. of butter and melt. Add the remaining 2 Tbsp. sugar and cook, stirring constantly, until the sugar starts to caramelize, about 2 minutes. Add peaches to skillet and increase heat to medium-high. Cook, stirring frequently, until softened, about 2 minutes. Briefly re-blend the batter, then pour evenly over peaches. Transfer the skillet to the pre-heated oven. Bake pancake until puffed and golden brown all over, about 18-22 minutes. It will deflate as soon as it's removed from the oven. Don't despair. That's what it is supposed to do. Dust pancake generously with powdered sugar and top with 3 or 4 scoops of vanilla ice cream. Top ice cream with some blueberry sauce, then serve immediately right from the skillet. So I got it in my mind that I need to make a dutch baby and started looking around like I usually do before settling on / or tweaking a recipe. Look what I found! This is a beautiful dessert Jennifer and your photos are gorgeous – sorry it cost you a broken arm – ouch! I started looking around again and found another beautiful recipe and would you believe it was also attributed to you! Love this and I hope you don’t mind but my surplus of strawberries is calling – may have to give this a go! 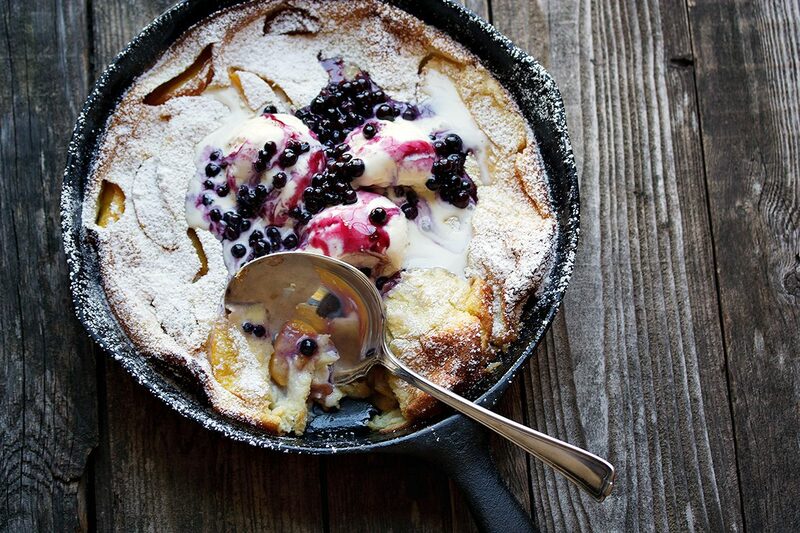 Your pics are amazing and the Dutch baby looks to die for! Jennifer! This post is perfection, except for your wrist! Oh my word. I can’t even imagine blogging (let alone everything else you do) in a cast! Bless your heart. Hugs. Hi this looks so good and I really want to make it but we just had to throw away our cast iron skillet can I use a regular pie pan or 10 inch ramekin? Hi Chelbi, Absolutely you can. I’d use something with higher sides than a pie pan, but otherwise a 9-10 inch round dish or pan of some sort should work just fine. I just was wondering why this is called a dutch baby? I am dutch and live in the Netherlands (home of the dutch) and we do not know of any dessert that even remotely resembels this… I just don’t understand why it is a ‘dutch’ baby… Can you explain? YUM! I’m going to have to make this for dinner tonight. 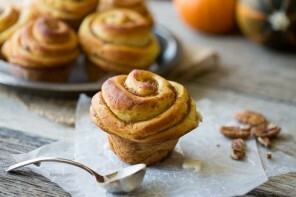 Such a beautiful recipe and lovely photos! I hope your wrist has mended now. Looks amazing. I love the flavor combination and it is a lovely photo, but not worth breaking your wrist. I hope you healed well and have found a safer way to take pics. Hi Laura and thanks for asking. Yes, I am all healed (except for the part where my arm now predicts the weather). And yes, I have invested in a little (safer) step ladder for times like these. Ok falling off a chair while shooting a top down shot is one of my biggest fears. So much so that I don’t do it unless my man was around to um, hold me while I’m perched. And it looks like that habit isn’t going to change after reading your story! I’m so sorry to hear about your wrist and I wish you a speedy recovery. this looks amazing! and um thanks for baking & taking the fall for us, so we could enjoy this amazing shot! Beautiful images! I have always wanted to make a Dutch baby and now you have inspired me. Love seeing that ice cream melting all over it. Yum! Yum! 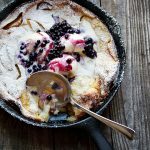 That looks amazing…I’d never heard of a dutch baby before about a year ago, but I think I’m going to have to try one soon! As soon as I saw this photograph my mouth started to water! I love blueberries and peaches together … And vanilla ice cream … Heaven on a plate. I’m going to the store right now to get ice cream! I’m so sorry about your wrist and hope you heal quickly. I look forward to reading your blog each week and seeing what you have been cooking. Thanks so much, Iva. And it tastes as good as it looks.